Bringing home a box of peepers is one of the best feelings in the world. 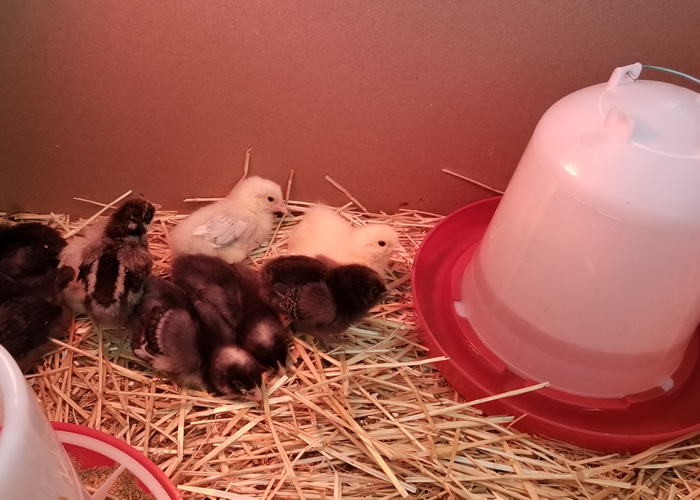 Opening the box and seeing the new chicks bouncing around, stopping only to study you with their large inquisitive eyes, is nothing short of breath-taking. Until the panic sets in…they need to eat now! Hatchery chicks will most likely arrive a day or two after they have hatched. They are dry and fluffy. By the time they arrive at their new home, they need to eat and desperately need to be re-hydrated. Some smart chicks will know what to do almost immediately, some have no idea, and some may be too weak to figure it out on their own. To assist a chick in taking their first drink of water I simply take them in my hand, hold them firmly but gently, and lightly dip the tip of their beak in the water— just the very tip to wet their whistle. I then watch them swallow awkwardly and set them back down. Many times that little bit of water is enough to make them instinctively go for more. To feed, I tap my finger on their food dish or at food on the bottom of their brooder. It is amazing to watch them rush to see what my finger is tapping on. It’s as if my finger were a mother hen pecking at tasty ground-treats. It works like a charm every time! There are times when a chicken needs to be handled to be moved or to receive medical attention. Chasing a chicken is not a productive way to get a hold of them, nor is it meant to entertain neighbors as mush as it usually does. This is usually a lesson all new chicken owners learn quickly. Chickens are wired to run…fast. They are extremely swift and agile. So, instead of chasing my chickens, I wait until dusk when they are roosting to make my move. Chickens become almost lethargic and drowsy at night. In most cases, a chicken can be plucked from its perch in the middle of the night with no issues. This is a time to consider clipping their wings as well. Whether kept in confinement or free-range, chickens are at risk of attack from predators large and small. One of the most effective ways of preventing attacks is to lock the chickens in their coop at night, even if they are free-range. If this is not possible at the end of every day, there are automatic chicken coop doors that lock and or close on their own. Chickens are smart and love to roost in the same place every night. Like clockwork, they will come home around the same time at the end of the day (based on the season). If there are aggressive predators please check your local and federal laws before considering culling predators. Some may be endangered or protected. Roosters! Yes, roosters, to some, are considered a pain. They can be noisy, and some can be mean. But they are great for protecting their hens from aerial predators. After a few years of losing hens to hawks, I decided to add a rooster to my flock and I haven’t lost a hen to an aerial predator. Not all towns allow roosters so it’s important to check the local ordinances before adding a roo. I remember the first time my rooster signaled all of his hens to rush to the cover of the forest, I was at my kitchen table looking out the window. Literally minutes later there was a brown tailed hawk scanning for prey. I still do not know how the rooster detected or sensed the hawk who was over the cover of the forest, but high respects for the diligent roosters who protect against predators. It’s easy to think that a chicken taking a dust bath is in distress or hurt. They wriggle and fluff about, and it almost looks as if they are injured. However, dust baths are good for chickens. 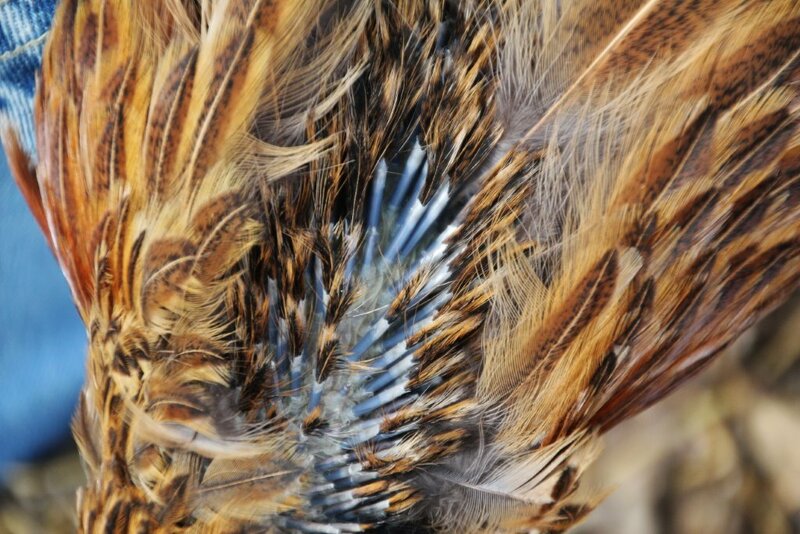 It helps them get rid of excess oils, preen their feathers, and deter and prevent mites and other unwanted hitchhikers. 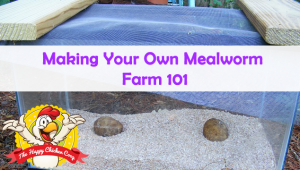 Confined chickens should be provided with an area to take a dust bath. They are completely happy with a pile of dirt from the garden. 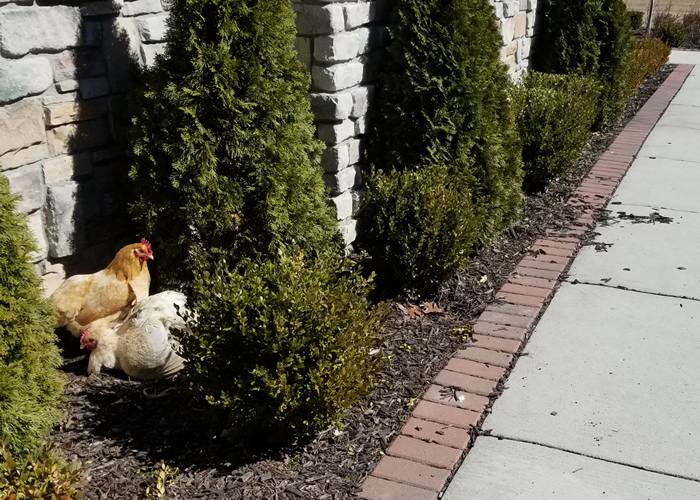 Free-range chickens will find their own special spot, and it’s usually a beloved flower bed or landscaping mulch like at my place! We are working on a solution to get them from returning so we can stop brooming our sidewalk. 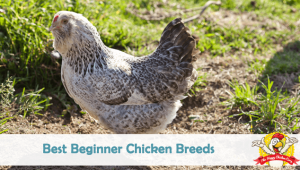 At first, a molting chicken looks like it could be sick or injured, however, it is simply something that each chicken goes through at least once a year. Molting can be stressful for chickens so it’s important that they have a place to stay safe and warm during this time. Additional protein can also be fed to provide them with the energy they need to get through the stress of a long and embarrassing molt. Most people want to add chickens to their homestead for the eggs or to be entertained by their delightful antics. It is important to research chicken breeds rather than running to the feed store and grabbing whatever is in the water tank. Some chickens lay more eggs than others. Some are better suited for cold climates than others, and some are friendlier than others. • Meat or Eggs – Some birds are bred as meat birds and do not lay eggs often, or at all. These birds will be labeled as meat chickens or broilers. This breed was not meant to live a long life. They grow very fast and if left unprocessed they often die due to heart conditions or the inability to carry their own weight. • Color of Eggs – There are a variety of beautiful eggs ranging from white, to light pink or blue, to brown and chocolate. • Size of Chicken – Bantams are small chicken, which also means they lay small eggs. These little mini me’s are best suited for people who may not have a lot of space to keep chickens. • Ornamental or Functional – Some chickens may lay very few eggs but are lovely to look at. Even the most inviting nesting boxes are no match for the warm, sunlit, just-out-of-reach, nook under the porch. Nothing is more frustrating than finding a clutch of old eggs in an area that you can’t reach. This often happens if chickens are free-range upon arrival, or if they’ve been free-range for a long period of time. They have their own preferences, so sometimes, they must be retrained to lay their eggs in a more accessible area. 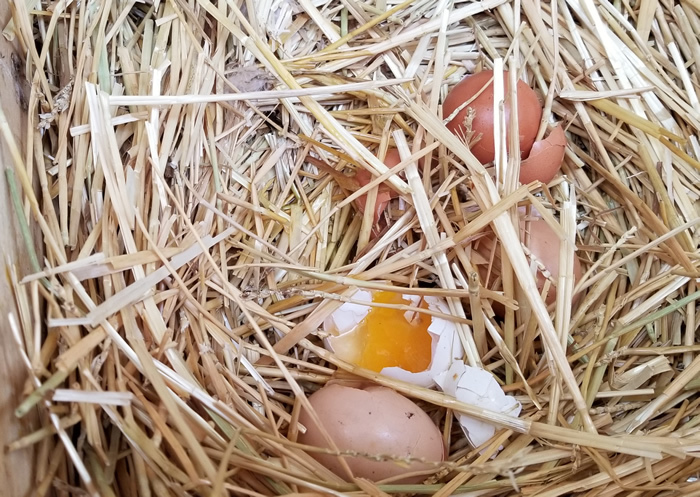 To remind a hen that the nesting box, that was so thoughtfully created for her, is the best place for her to lay eggs, she should be confined with the nesting box for at least a week and then re-released. She will most likely continue to return to her nesting box to lay her eggs. Chickens are wonderful creatures of habit…stubborn, but wonderfully predictable. Unfortunately, chickens are messy little critters. Throughout the brooding period and into adulthood, having the right containers not only keeps chickens clean, but it also keeps them healthy. Chickens scratch at the ground throughout their entire lives, which means they are also very messy in small areas. Water founts or waterers will often accumulate shavings, droppings, and feed as the chicks peck, scratch, and carry on as chickens do. A dirty fount or waterer is a great place for bacteria to grow, especially in the brooder or in humid weather. Founts and feeders that restrict the amount of waste that enter the trays are ideal for chickens. 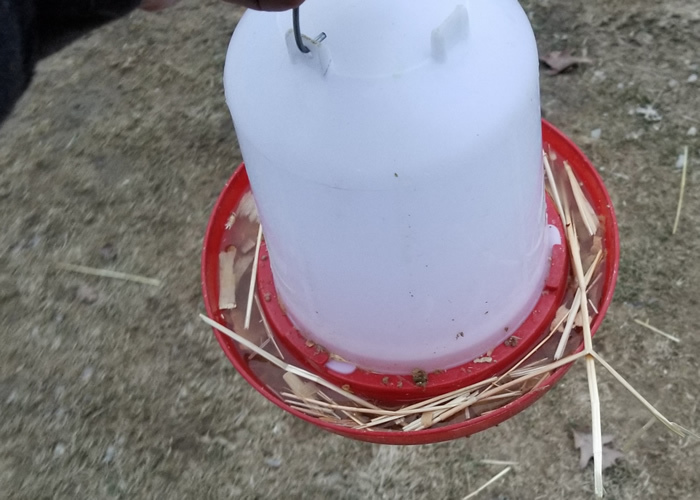 Also, it is wise to keep feeders off of the ground, preferably raised or hanging. This small adjustment can keep chickens from making a huge mess and putting their health at risk. We have a very in depth guide on waterers/founts here and feeders here. While it sounds strange, chickens have a tendency to eat their own eggs. This is frustrating when fresh eggs were expected on the breakfast table but none were collected from the coop. Usually, a telltale sign of egg-eating is when production seemingly stops and there are no signs of illness. Egg-eating often starts when an egg cracks under the weight of a hen. The hen becomes curious and pecks at the cracked egg, quickly realizing how delicious it is. Unfortunately, the rest of the flock takes note and also wants to try the egg. From there, the problem spreads like wildfire. It is like an epidemic, and extremely frustrating. The good news? The egg-pecking can be cured! First and foremost, making sure the flock has the grit and calcium they need is of the utmost importance. If the chickens don’t have what they need, they will seek out the calcium they crave in their own eggs. Then, simply adding a dummy egg, usually a porcelain egg, or golf ball, to the nesting boxes will be enough to deter egg eaters. Pecking at the fake egg is uncomfortable and unproductive for the chickens and they will usually give it up after a while. Need more help on this topic? Check out our full guide on egg eating prevention. 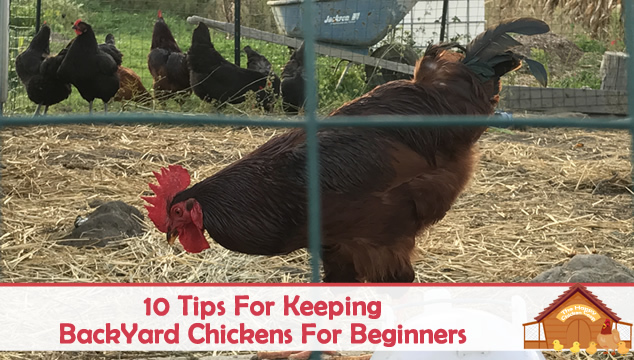 These tips will help keep chickens healthy and prevent early losses for beginner chicken owners. 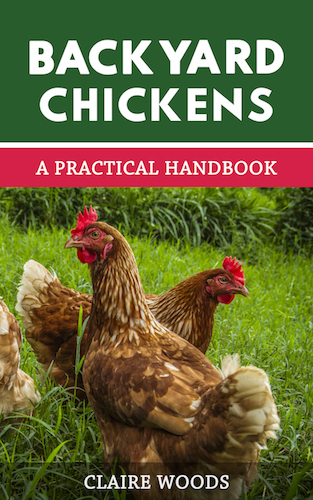 Chickens can be confusing and stubborn at times, so understanding their quirks and needs early on will ensure many years of delicious eggs and humorous backyard antics— that hopefully don’t include a chase between a human and a chicken.